Engage with free-from food brands who can help support your blog! Here at freedible, supporting the bloggers who are creating innovative recipes, publishing practical tips & raising awareness for custom eaters of all ages and with all kinds of conditions is a huge part of what we do. In fact, it's a central part of how we achieve our mission of empowering custom eaters. 1) Edit your profile to make sure you're on the list(s)! Our custom profiles are the key to how we help our consumer and food brand members connect. Make sure you keep the food restrictions and lifestyle topics in your profile up to date, because we use these to help food brands identify the influencers they need. We also use these fields to create the "author lists" that you find throughout our Dibles - so keep yours up to date! 2) Check the box to let brands know you're interested in working with them! Starting in March, 2017, we've added a new "checkbox" to our blogger profiles allowing you to say whether or not you're interested in being contacted by food brands about brand ambassador and other opportunities. Make sure you "check the box" to let them know you're interested! 3) Use your recipes & tips like a calling card: share them in our searchable collections! 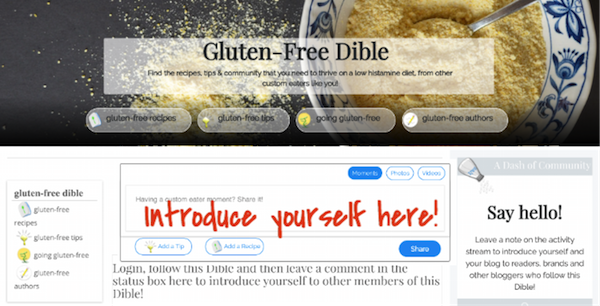 When you post a recipe or tip in freedible's community-wide collections with a link back to your blog, we "slice and dice" them to put them into all of the Dibles, campaigns and curated conversations where they're relevant. And, your posts put you front and center where our brand members are looking to find new recipe developers and authentic storytellers who would be a good fit for their products. 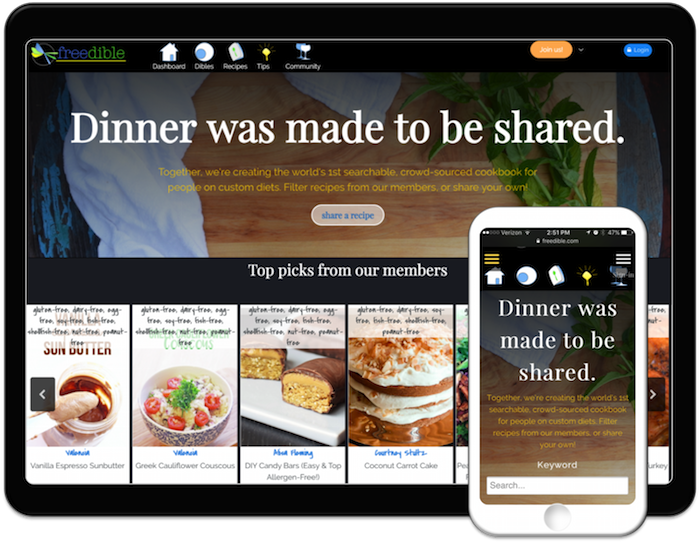 In addition, each recipe or tip that you share will automatically be added to your profile, creating a mini portfolio of your work that can help to attract new brand members. Want to hear the icing on this gluten-free cake? We can see from our analytics that the traffic really does flow through to you, so you get new readers, too! 4) Take advantage of our Dibles to introduce yourself to "your tribes," and lead them! Since we launched in 2013, the freedible community has been steadily building a truly unique resource for custom eaters: searchable recipes, tips and stories that are by custom eaters, for custom eaters - and the food industry is taking note! In spring, 2017, we took this one step further, by combining our content-driven "guides" and our community spaces into Dibles. Each one is like a mini freedible for a particular diet, health or lifestyle topic, and they're the perfect place to introduce yourself and your blog to other members of the community who eat like you do, and to free-from food brands who are hoping to meet you! Just follow the Dibles that are relevant for your blog and then say hello on the activity stream! Find out how you can take a leadership role in one of our Dibles as a freedible Host for more visibility! 5) Watch for our community-wide campaigns, and share the things you do! Freedible is about giving custom eaters options - and we're about creating the change we custom eaters need to thrive. Watch your inbox and notifications in our Bloggers Lounge to find out about upcoming campaigns and other opportunities to join our community-wide conversations. Each campaign includes special themes for both recipes and tips - when you share your own work on those themes (with a link back to your blog if you like), we automatically include them on our special feature page, and they'll be in consideration for our special edition newsletters, which goes straight to our brand, consumer and blogger members' mailboxes. It's just one more way we keep the focus on your content, and let it lead the way to create new relationships for you! 6) Don't be shy - they're here for you! We've shared our community with hundreds of free-from food brands over the years, and we've watched as the industry has come to recognze the value of powerful, authentic storytellers and quality recipe developers. It's true, many food brands and other consumer marketers are still focused first on a blogger's reach, and undoubtedly that will continue to be a consideration as they seek out new brand champions. But as the social media market has matured, they've come to realize that they already have reach they can bring to a niche blogger with a passionate but small following - and that passion is something you can't buy. We can tell you honestly, from hundreds of conversations, that our brands are here to meet you. So don't be shy - follow their freedible profile, leave a note on their profile wall telling them how much you love their products and watch for opportunities to engage alongside them by joining our community-wide conversations. They'll be glad to meet you!